It seems that more and more these days, asthma is on everyone’s mind. After all, it affects 20 million Americans and 5 million of those are children. It seems those rates in children are skyrocketing. Asthma may begin in childhood, or you may not be affected by it until you are an adult. Either way, there is much you need to know about this condition. Asthma can be very mild, or life threatening. It may bother one person minimally a few times a week; for someone else, they may end up in the emergency room fighting for every breath. 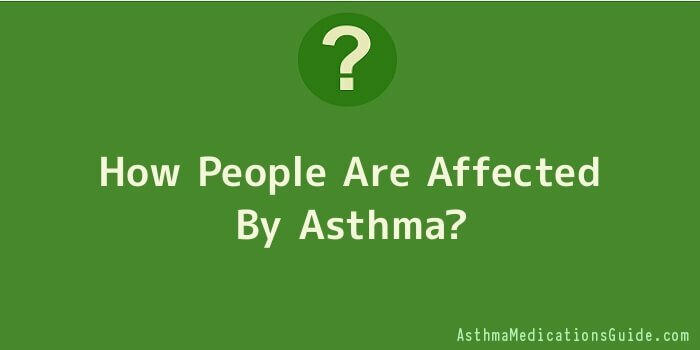 So, just how are people affected by asthma? Asthma affects everyone differently. No two symptoms may trigger the same responses in individuals, just as no two triggers may bring on the same asthma results. By knowing the signs and symptoms of asthma, you are giving yourself a big advantage in helping to control this incurable disease. If you have a family history of relatives with asthma, your chances of contracting it is heightened. That’s not to say you will develop asthma as an absolute certainty, but you are more genetically prone to it. Asthma is like living with other chronic diseases, such as high blood pressure, diabetes, or heart disease. The more information you have about your condition, the better you will be in lessening its effects. Medications may help to alleviate symptoms, or they may be needed only minimally. Again, it depends on the individual and what their health condition already is; older people, for instance, already suffering from other ailments may require treatment and medications that are far different from a younger, healthier person. Maintaining a healthy and active lifestyle is very important, learning to eat the right foods, staying away from any food preservative allergens is important. Occasionally, an individual needs to alter their exercise routine or is advised to cut out certain strenuous sports activities. If these things will lessen your chances of having asthma attacks, then you have a decision to make. After all, your health is always up to you.